Tobi Kahn is a New York-based painter, sculptor, and educator, who for thirty years has been steadfast in his commitment to the redemptive possibilities of art. MOCRA director Terrence Dempsey, SJ, spoke with Kahn about integrating faith and heritage with his artistic practice, his commissions for public sacred spaces, and how MOCRA has impacted his career. Tobi Kahn is a New York-based painter, sculptor, and educator, who for thirty years has been steadfast in his commitment to the redemptive possibilities of art. Kahn's art is strongly influenced by his Jewish faith as well as by artists such as Albert Pinkham Ryder, Georgia O'Keefe, Arthur Dove, and Mark Rothko. He was selected as one of nine artists included in the 1985 Guggenheim Museum exhibition, New Horizons in American Art. Since then his work has been shown in over 40 solo exhibitions and over 60 museum and group shows. His works are found in major museums, corporate, and private collections. He has also been commissioned to create contemplative sacred spaces. Kahn has taught on the faculty of the School of Visuals Arts in New York City since 1985. MOCRA presented two major traveling exhibitions by Kahn. Metamorphoses included paintings evocative of land- and seascapes, and scientific imagery. The second exhibition, Avoda, presented Jewish ceremonial objects Kahn has created for family and friends. Visit Tobi Kahn's website here. Read Amy Wallach's Janary 7, 2001 New York Times article "The Impenetrable That Leads to the Sublime" here. Learn more about German artist Wolfgang Laib here. Kahn's work was included in a 1986 exhibition at The Jewish Museum in New York titled Jewish Themes: Contemporary American Artists Part II, curated by Susan Goodman. Learn about yeshivas in this Wikipedia article. The term "Holy of Holies" refers to the inner sanctuary of the Jewish Temple in Jerusalem where the Ark of the Covenant was maintained. Read more in this Wikipedia article. The Jewish priesthood wore garments specific to their order, and the High Priest of Israel had additional special vestments, as described here. The Twelve Tribes of Israel, listed here, took their names from the sons of the patriarch Jacob. The Bible makes some references to standards or flags for the Twelve Tribes, and fuller descriptions of them are found in midrashic sources. Learn more here. 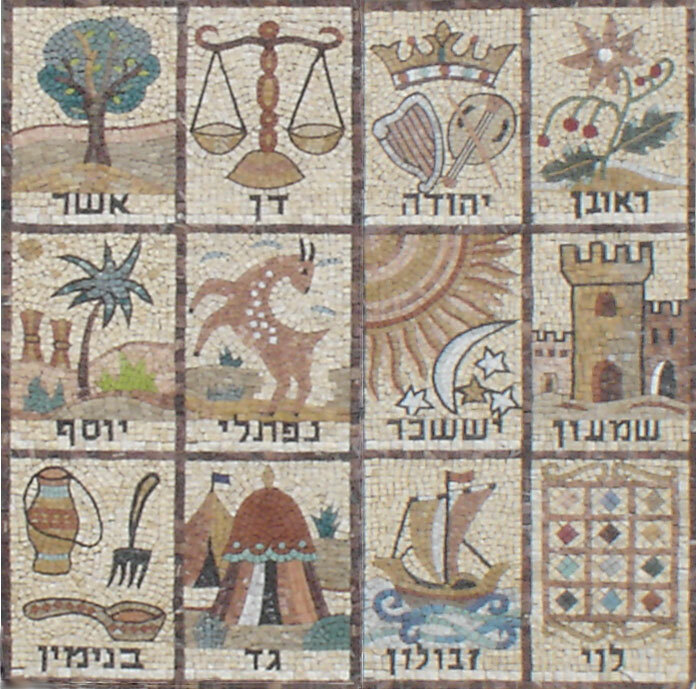 Mosaic of the 12 Tribes of Israel, from Givat Mordechai synagogue wall in Jerusalem. Top row, right to left: Reuben, Judah, Dan, Asher. Middle row: Simeon, Issachar, Naphtali, Joseph. Bottom row: Levi, Zebulun, Gad, Benjamin. Kahn makes reference to the extravagant movie epics based (sometimes loosely) on Biblical stories produced by Hollywood in the 1950s and 1960s. One well-known example is the film The Ten Commandments (1956), starring Charleton Heston. The film's depiction of the parting of the Red Sea was perhaps the most complex visual effect attempted up to that time. Italian poster for The Ten Commandments (1956), featuring the parting of the Red Sea. Collection of Michael Morris, OP. Photo by Jeffrey Vaughn. Learn more about painter Mark Rothko (1903-70) with this National Gallery of Art interactive biography, or in this Wikipedia entry. Learn more about painter Chaim Soutine (1893-1943) with this Museum of Modern Art biography, or in this Wikipedia entry. The Talmud collects the teachings and opinions of generations of rabbis on a variety of subjects, including Jewish law and ethics, philosophy, customs, history, lore and much more. Learn more in this Wikipedia article. Albert Pinkham Ryder (1847-1917) is known for his atmospheric, suggestive paintings. Learn more about Ryder on the Phillips Collection website. Albert Pinkham Ryder, Moonlit Cove, early to mid-1880s. The Phillips Collection. Kahn's work was included in a 1999-2000 exhibition at the Albright-Knox Art Gallery in Buffalo, New York, titled Landscape at the Millennium, which paired nineteenth-century landscape paintings from the collections of the Albright-Knox Art Gallery and the Parrish Art Museum, Southampton, New York, with two contemporary installations by Kahn and painter Pat Steir. Find the exhibition catalogue on WorldCat. Tobi Kahn: Sky & Water was shown at the Neuberger Museum of Art in Purchase, N.Y., in 2003. Read Benjamin Genocchio's review in The New York Times here. Find the exhibition catalogue on WorldCat. Josef Albers (1888-1976) was an artist and an influential theorist and educator. He is particularly known for the Homages to the Square he painted between 1950 and 1976 and for his 1963 publication Interaction of Color. Learn more about Albers and his approach to art education on The Josef & Anni Albers Foundation website. James Turrell (b. 1943) is an American artist primarily concerned with light and space. Among other works, he is known for his "skyscapes" and his ongoing project to transform the Roden Crater. Visit the artist's website, or browse this brochure from a 2014 retrospective at the Los Angeles County Museum of Art. Wolfgang Loeb (b. 1950) is a German artist whose work is often highly conceptual and employs predominantly natural, organic, ephemeral materials. Explore an interview with Laib on Art21, or a 2013 installation at the Museum of Modern Art. Artist Doug Wheeler (b. 1939) is considered a pioneer of the "Light and Space" movement in Southern California in the 1960s and 1970s. Learn more about Wheeler and see images of his work here. See images of Kahn's meditative space at the HealthCare Chaplaincy in New York here. Read about other sacred space projects by Kahn in this article in Image and this article in Tablet Magazine. In the Bible, Exodus chapter 31 recounts how God selects Bezalel as the architet of the mishkan or Tabernacle, the portable dwelling place for the divine presence during the Israelites' desert sojourn. Read more about the Tabernacle in this Wikipedia article, or read a reflection on what the story of Bezalel has to say to artists and architects today. See 03:05 above for a link to the Jewish Museum exhibition. Kahn's work was included in a 1987 exhibition at the Everson Museum in Syracuse, NY, titled Sacred Spaces, curated by Dominique Nahas. Find the exhibition catalogue on WorldCat. See discussion of the Holy of Holies above at 05:05. Jane Blaffer Owen (1915-2010) dedicated much of her life to the small town of New Harmony, Indiana. Situated on the Wabash River, New Harmony was the site of two 19th-century utopian communities. Under Owen's guidance and with her patronage, it also became home to a rich body of contemporary art and architecture by figures such as Richard Meier, Jacques Lipschitz, Philip Johnson, and Stephen DeStaebler. Read a remembrance of Owen by Fr. Dempsey. Learn more about the many facets of New Harmony on the website of the Robert Lee Blaffer Foundation. 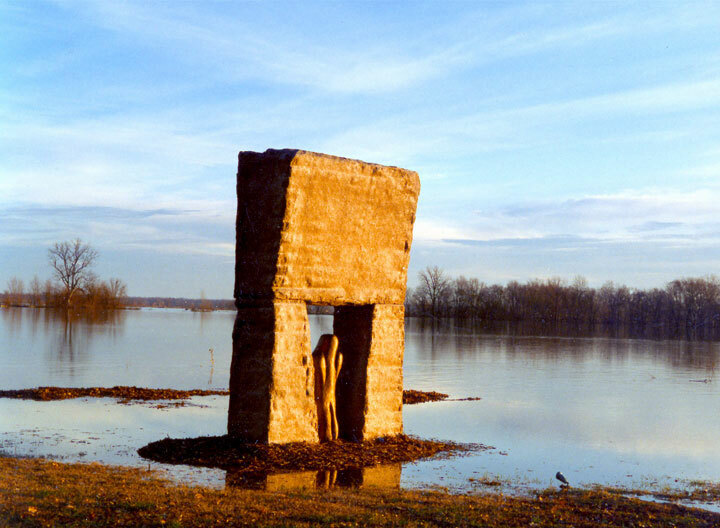 Kahn's 1993 sculpture Shalev is situated in New Harmony on the banks of the Wabash River. Listen to an audio guide to Shalev and other New Harmony sites here. Peter Selz is a renowned curator of contemporary art as well as a historian of German Expressionism. Selz became the curator of the department of painting and sculpture at the Museum of Modern Art, New York in 1958. In 1965 he was called to the University of California, Berkeley to found the university's art museum. Peter Selz served as its director from 1965 to 1973. He is known most recently for his provocative, politically charged exhibitions like "The Art of Engagement", which showed at the American University Museum at the Katzen Arts Center in 2006. Selz curated the exhibition Tobi Kahn: Metamorphoses, which was shown at MOCRA in 1998, as well as the Patrick Graham retrospective The Silence Becomes the Painting, shown at MOCRA in 2012. Selz has spoken at MOCRA twice, in 1995 on the topic of "Degenerate Art," and in a 2012 panel discussion on the work of Patrick Graham. Watch "Breaking Boundaries: A Conversation about the Art of Patrick Graham" here. Jane Daggett Dillenberger (1916-2014) was one of the pioneers in the dialogue between modern art and religion, beginning her work in the field of art history in 1942. As Professor Emerita in Art and Religion at the Graduate Theological Union, in Berkeley, California, she remained actively involved in the "religion and the arts" program at the Graduate Theological Union until her death. In addition to her teaching, she was a curator and a scholar. Her most important exhibitions were the 1972-73 The Hand and the Spirit: Religious Art in America, 1700-1900, which she co-curated with art historian and museum director Joshua Taylor, and its sequel, Perceptions of the Spirit in 20th Century American Art, which she co-curated with her then-husband, theologian John Dillenberger. Her books include Image and Spirit in Sacred and Secular Art, Style and Content in Christian Art, and The Religious Art of Andy Warhol. Her final book, The Religious Art of Pablo Picasso, co-authored with art historian John Handley, was published in 2014. Dllenberger gave a keynote address at "The Artist and Sacred Space," a 1992 conference marking MOCRA's opening. She also appears in a MOCRA Voices episode with Rev. Ralph Peterson discussing St. Peter's Lutheran Church in Manhattan. Alberto Giacometti (1901-66) is best known as a sculptor, although he was a capable painter, printmaker and draughtsman as well. He was associated with the Surrealists in Paris in the 1930s, but his later work was influenced by Existentialist thought. Learn more at the Fondation Alberto et Annette Giacometti website. Henry Moore (1898-1986) is best known for his semi-abstract monumental bronze sculptures, many displayed as public works of art. Like Giacometti, he is associated with representations of the human figure, but where Giacometti's figures tend to be attenuated and spare, Moore's are often undulating and even voluptuous. Find further reading about Moore at The Henry Moore Foundation website. 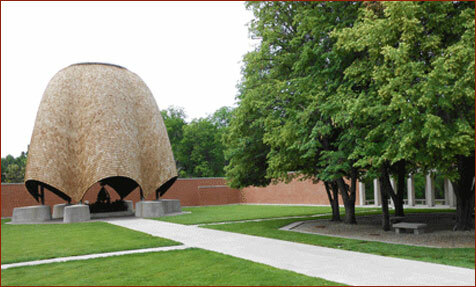 The Roofless Church is a structure in New Harmony designed by renowned architect Philip Johnson. The non-denominational church was commissioned by Jane Blaffer Owen and dedicated in 1960. Johnson and Owen envisioned a church where the only roof large enough to encompass a world of worshipers was the sky. Learn more about the Roofless Church here. Visit the Fort Wayne (Indiana) Museum of Art website. The Cornell Fine Arts Museum at Rollins College in Winter Park, Florida, presents Tobi Kahn: Reverie in 2015. Visit the exhibition website. Michael Brenson was an art critic for The New York Times from 1982 to 1991. Author of several books on art, he is a Getty scholar and Guggenheim Fellow, a Visiting Senior Critic in the University of Pennsylvania School of Design's Department of Fine Arts, and a member of the sculpture faculty in Bard College's Milton Avery Graduate School of the Arts. He is also a faculty member at the School of Visual Arts. Watch a 2012 talk by Brenson at the Ulrich Museum of Art in Wichita, KS. Alexander Calder (1898-1976) was an American sculptor known known for his innovative mobiles, kinetic sculptures made with delicately balanced or suspended components which move in response to motor power or air currents. His Cirque Calder (1926-31) is a collection of models made from wire, wood, and other materials, designed to perform the various functions of the circus performers they represent. Calder's circus is part of the permanent collection of the Whitney Museum in New York. Lyonel Feininger (1871-1956), a major figure of the German Bauhaus, is renowned for his paintings of architecture and seascapes, but his work had a more whimsical dimension, including comic strips and miniature hand-carved wooden figures and buildings, known as City at the Edge of the World. Learn more about Feininger on the Whitney Museum website. Special calendars are used to count off the seven weeks of the omer, the 49-day interval beginning on the second day of Passover -- when an omer, or measure of barley, was offered at the Temple in Jerusalem -- and ends on the day before Shavuot, celebrating the giving of the Torah to the Israelites at Sinai. Symbolically, the time between the two holidays traces the path from physical freedom (the Exodus) to spiritual freedom (attained by the acceptance of the law). Kahn's Saphyr is a 7 x 7 sculptural grid with 49 pegs conceived as miniature houses, each with a unique shape. This work is now in the collection of The Jewish Museum, New York. Nessa Rapoport is Senior Program Officer at the Charles H. Revson Foundation. Previously, she was a senior editor at Bantam Books, where she specialized in memoirs. She is the author of a novel, Preparing for Sabbath; a collection of prose poems, A Woman’s Book of Grieving; and a memoir, House on the River: A Summer Journey. She writes and speaks frequently on Jewish culture and imagination and has collaborated on projects with her husband, Tobi Kahn. Find works by Nessa Rapoport on WorldCat. Explore the Avoda: Objects of the Spirit exhibition website here. View Kahn's Holocaust Memorial Garden at the Lawrence Family Jewish Center in La Jolla, CA. View pictures of Kahn's Holocaust Memorial Garden at the Kaplen JCC on the Palisades in Tenafly, NJ. View images of Kahn's installation in the sanctuary of Congregation Emanu-El B'ne Jeshrun in Milwaukee, WI. View images of Kahn's installation in the Elliot Binder Chapel of Temple Beth El of Northern Valley in Closter, NJ. See above at 06:30 for a discussion of Kahn's installation at the HealthCare Chaplaincy in New York. Listen to a full discussion of the Louise Nevelson Chapel of the Good Shepherd at St. Peter's Lutheran Church in Manhattan in this MOCRA Voices episode with Rev. Ralph Peterson and Jane Daggett Dillenberger. Artist Elke Reva Sudin is Founder and Executive Director of Jewish Art Now; her husband, filmmaker Saul Sudin, is Co-Founder and Creative Director. Jewish Art Now seeks to serve as "a central portal for the convergence of Judaism and contemporary art with a fresh and innovative perspective. . . . Jewish Art Now recharges Jewish identity and its relationship to the visual through engaging exhibitions, interactive events, and dynamic media content on the web. Visit Jewish Art Now. Kahn refers to another initiative linking Judaism and contemporary art, the Jewish Art Salon, which describes itself as "an international artist-driven community that promotes understanding and appreciation of contemporary and innovative Jewish visual art." Its projects include exhibits, interactive art events, and bi-monthly salon sessions in the New York City area with international artists and scholars. Visit the Jewish Art Salon website. Artist Yona Verwer is Executive Director of the Jewish Artists Salon. Rabbi Leon Morris is currently Shalom Hartman Institute of North America Vice President for Programs in Israel. He was also the founding director of the Skirball Center for Adult Jewish Learning at Temple Emanu-El in Manhattan. Read about the Artists' Beit Midrash in this post on Jewish Art Now. Learn more about the beit midrash in general in this Wikipedia article. Kahn's family name dervies from the Hebrew word for "priest," kohen (כֹּהֵן). This Wikipedia article describes the biblical origins and ancient role of the Aaronic priesthood, as well as its place in the context of contemporary Judaism. We should note that Jewish worship is a richly layered tapestry of texts and practices, which cannot be done justice here. That being said, Kahn refers to Amidah, a series of blessings that are central to Jewish worship. Avodah, signifying worship, labor or service, is one of these blessings, and asks God to restore the Temple services and sacrificial services. Explore this text here. To this day in many Jewish congregations, Kohanim impart the priestly blessing found in Numbers 6:23-27. Learn more about this blessing here. See above at 22:55 for a discussion of the exhibition Avoda: Objects of the Spirit, shown at MOCRA in 2003. Laura Kruger has been curator of the Museum at Hebrew Union College - Jewish Institute of Religion since 1991. Read about her accomplishments here. Visit the School of Visual Arts website here. George McNeil (1908-95) was an abstract expressionist painter who taught at the University of Wyoming, Pratt Institute, and the New York Studio School. Explore an oral history interview with McNeil in the Archives of American Art.